The new logo for Fiat's automotive business aims to create a strong link between the past and future. TURIN – Fiat Group unveiled new logos on Monday that will identify the Italian conglomerate's automotive and industrial companies after the operations are separated in a Jan. 1 demerger. The new logo for Fiat S.p.A., the demerged company that will focus on the automobile sector, was inspired by a Fiat logo used at the beginning of the 20th century. The design has the word Fiat in condensed blue lettering on a white background. Fiat said the reinterpretation of an iconic earlier logo is intended to create a visual identity that portrays a strong link between past and future, but is also modern and innovative. Underneath the Fiat name are the words Società per Azioni (S.p.A.), which mean the business unit is a joint stock company. “The new logo has been created in response to the need to differentiate the automobile group from the product-related brand, reinforcing the parent company's role in the management of a multibrand group,” Fiat said in a statement. Fiat S.p.A. will include the Fiat, Alfa Romeo, Lancia, Ferrari, Maserati, Fiat Professional and Abarth brands and their related powertrain operations, plus partsmaker Magneti Marelli, production system maker Comau and Teksid, which produces metallurgical products. Fiat Industrial S.p.A., the demerged company that will control the Case New Holland farm and construction equipment maker, Iveco heavy truck manufacturer and their related powertrain activities, will have a new logo that maintains the visual identity created for Fiat Group in 2005. 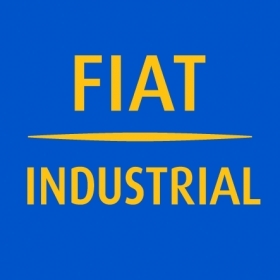 Its new logo has the words Fiat Industrial in burnt gold lettering with Fiat's traditional blue as a background color. 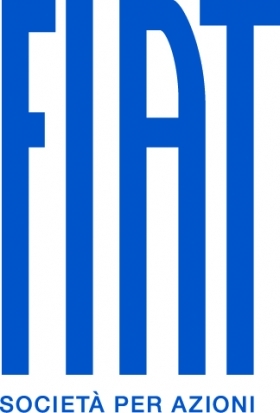 Fiat Industrial's logo uses the Italian group's traditional blue background with letters in burnt gold. The new logos were created Robilant Associati, the agency that created the Fiat Group logo in October 2005 and revised the Alfa Romeo, Lancia and Fiat passenger car brand logos. On Jan. 1, the new Fiat S.p.A. and Fiat Industrial S.p.A. will begin operating as separate companies and will have their own listed shares on the Milan Stock Exchange beginning Jan. 3. Fiat CEO Sergio Marchionne will be CEO of the new Fiat S.p.A. and will also become chairman of Fiat Industrial. Iveco CEO Alfredo Altavilla and CNH CEO Harald Boyanovsky will be co-CEOS of Fiat Industrial. Fiat S.p.A. forecasts revenue of 64 billion euros in 2014, up from just over 32 billion euros expected this year, on unit sales of 3.8 million, up from 2.2 million last year. Fiat Industrial predicts revenue of 29 billion euros in 2014, compared with about 19 billion euros expected this year.